When it comes to fall decorating, I like to keep it simple. Replace the red-and-white gingham placemats on the breakfast table with rust-and-gold gingham placemats. Put a funny resin witch with crazy orange tresses (not unlike my own hair first thing in the morning) on the window sill above the kitchen sink. Pull the pink petunias out of their pot and plant purple pansies. With faces, just like the ones my grandmother used to grow. And, most important of all, purchase some pumpkins. That’s the hard part. Used to be, the only decision when buying a pumpkin was whether to choose a Bert (tall and skinny) or Ernie (short and squatty), named—of course–after the Sesame Street characters. Back in those days, pumpkins were smooth-skinned and bright orange. Not anymore. These days, pumpkin farmers grow a variety of colors. Pale orange. Blood-red. Ghost white. Green. Even black. Pumpkins come striped and solid and mottled, some small enough to fit in the palm of your hand and others so big it takes a front end loader to lift them. They’re not traditionally-shaped anymore, either. Some are flat as a Frisbee, others round as a volleyball. And some pumpkins are so lumpy and deformed that you can’t put a name to their shape. Strangest of all are the “warty” pumpkins. The first time I saw one, I thought it was diseased. Here was a pumpkin desperately in need of a top-notch dermatologist. Who in the world would buy such a pumpkin? In olden times, choosy shoppers would consider a pumpkin with even one bump defective. Nowadays, they’re so in demand that growers have begun to genetically engineer pumpkins in order to produce warts. 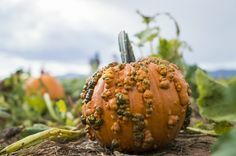 One website I visited claimed that it took ten generations of cross-breeding to come up with a pumpkin with a dreadful case of acne. Which do make very cool, albeit creepy, jack-o-lanterns. Not that I’m planning to carve any of the pumpkins I bought. For one thing, I’m no good with a knife. For another, I’m hoping my pumpkins will remain rot-free until I’m ready to replace them with poinsettias. To that end, I did some research on to how to best preserve decorative pumpkins. I learned that they should first be washed with warm soapy water and then, in order to kill bacteria, soaked in a solution of two tablespoons bleach per gallon of water. Next comes the hard part. After the pumpkins dry thoroughly, they should be coated with petroleum jelly. No kidding. Not only will this give them an attractive sheen, it will fill in microscopic cracks and thus delay decay. Last week, I bought several pumpkins and went to work on them. Washing and bleaching were no problem. Neither was rubbing in the Vaseline. Not on the smooth pumpkins, anyway. A Burt-shaped green-and-beige striped one, a white Ernie, and several bright orange mini-pumpkins glowed softly in the light of an autumn afternoon after being treated. But—no surprise!—coating the warty pumpkins proved difficult. And frustrating. So frustrating that I soon gave it up as a waste of time. Those lumpy, bumpy un-Vaselined pumpkins now nestle on my hearth with their smooth-skinned cousins in what just might prove to be an interesting science experiment. Only time will tell if the greased pumpkins will outlast the ungreased ones. But for now, at least, I celebrate the fact that my fall decorating is done.